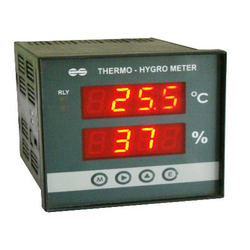 We are a leading Manufacturer of big display process indicators control, thermo hydro meter, process indicator controller, process indicator 5 digits, process indicator retransmission and big display process indicator from Nashik, India. Electronic Switches (I) P. Ltd; offers 4 Digits, Micro controller Universal Indicator with micro controller based technique with selectable 0 - 10V DC / 4 - 20mA and user settable. 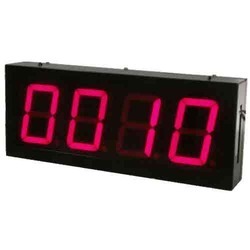 Display size is 4 inch seven segment display to suit the requirement. Units operates on 220V AC supply and accepts universal input from 0-10 V DC or 4 - 20 mA which is selectable. Range is user settable ( 0 - 10V or 4 - 20mA). Also Single or Two relay output models are available. Output will be relay output NC - C - NO with Retransmission output 4 - 20mA. 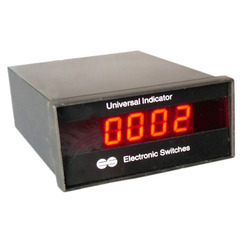 Electronic Switches (I) P. Ltd; offers 3 Digits, Temperature Indicator with 1/2 inch / 4 Inch seven segment LED display. Units operates on 220 Volts AC supply. Upper display will show Ambient temperature with degree C symbol and lower display will show Humidity indicator with H symbol. Sensor will be in-built for temperature and humidity. We have achieved a distinct position in the market by providing Process Indicator Controller. Our provided process indicator is developed by highly skilled professionals using finest grade raw material & latest technology keeping in sync with the norms of industry. Offered process indicator is powerful, highly flexible and can accept inputs from variety of sensors like all types of RTDs, pressure transducers & thermocouples. We offer this process indicator in various technical specifications and can be custom design in order to meet the diverse requirements of the customers. Electronic Switches (I) P. Ltd; offers 4 Digits, Micro controller Universal Indicator with micro controller based technique with selectable 0 - 10V DC / 4 - 20mA and user settable. 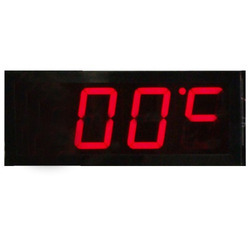 Display size is 1/2 inch seven segment display to suit the requirement. Units operates on 220V AC supply and accepts universal input from 0-10 V DC or 4 - 20 mA which is selectable. Range is user settable ( 0 - 10V or 4 - 20mA). Also Single or Two relay output models are available. Output will be relay output NC - C - NO. We are remarkable entity, engaged in offering a superior assortment of Process Indicator 5 Digits. The offered process indicator is manufactured utilizing high grade raw material and advance technology in accordance with the norms of industry. In addition, our process indicator is used in displaying various parameters such as, temperature, pressure, flow, viscosity, pH & displacement. Our customers can avail this process indicator from us in different specifications. DETAILS Electronic Switches (I) P. Ltd; offers 5 Digits, Micro controller Universal Indicator with micro controller based technique with selectable 0 - 10V DC / 4 - 20mA and user settable. 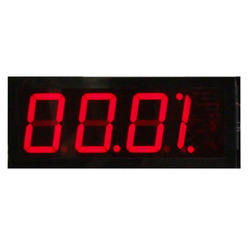 Display size is 19mm seven segment display to suit the requirement. Units operates on 220V AC supply and accepts universal input from 0-10 V DC or 4 - 20 mA user selectable. Range is user settable ( 0 - 10V or 4 - 20mA). Also available relay output models. 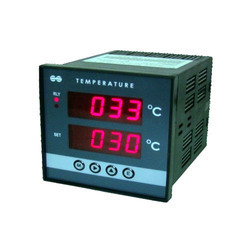 These are used in displaying various parameters such as, temperature, pressure, flow, viscosity, pH, displacement, speed, etc; proportional to the input signal. We are actively engaged in manufacturing and supplying superior quality Process Indicator Retransmission. This process indicator is widely used for measuring currents, resistance, AC / DC voltages and temperature. Offered process indicator is accessible in numerous specifications so as to meet the demands of customers. Besides, this process indicator is stringently tested on various quality parameters to ensure its defect free range.